If you do a search online for filmmaking production forms you'll find lists, a lot of them. Many have to do with the preproduction phase and also producing feature films. But if you're making small films and videos are any of these forms useful and why? The most obvious is for continuity because we shoot a script and even scenes out of sequence. Was her hair down or up for that scene? Was she holding the paper in her right or left hand? Reshoots and additional shots. It’s easy for us to edit during the production phase which gives us the advantage of seeing and fulfilling the need for reshoots or added shots. Knowing key information on a scenes lighting and camera setup can be crucial. 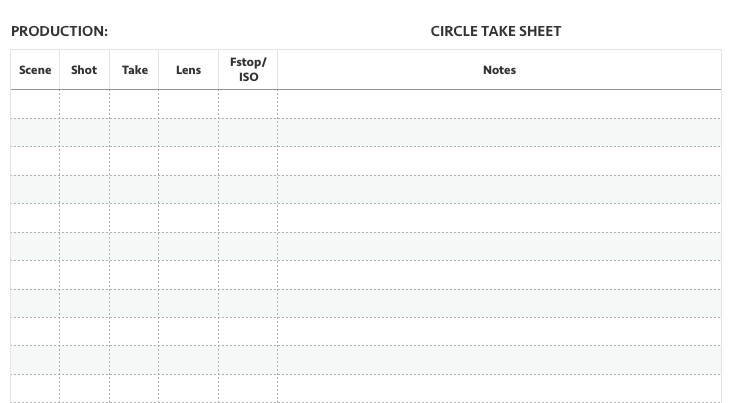 And last but not least, notes for postproduction like circle takes, used by the editor and director. While shooting you may remember why a decision was made onset for a shot but you won't remember days or weeks later when you're editing. There are three areas on set we focus on for our production notes. One is our subject: people, places, and props. The other is the lights that light them and third the camera that records it all. The first form is one of the most important, called Script Supervisor notes, and is sometimes called the circle take list. An example of our Script Continuity Sheet. It actualizes the shot list. You know, that long list you thought you would get through in one day. It shows what you actually shot, not want you wanted to and is therefore very important for the editor. Record the scene number if you have one (for youtube and shorts we don’t, it’s all one scene), the shot number, and the take. If it’s not a bad take but not good either, do nothing. If it’s a good take, circle it, hence the name circle take. Maybe mark what was good about it if it stands from the other takes. Circle take number for good takes, NG for "no good." If it was no good at all, maybe because you had to cut in the middle of the shot, mark NG for no good. I like to note why it was NG because the other takes may miss something this take captured. For example, if it was NG because we stopped in the middle of the take, the beginning may have something usable that could save the day in the edit. Add notes that may be helpful in post, like why a take was NG. There could be gold in that take elsewhere. In the notes, I mark continuity notes. The main thing to watch out for, anything that changes during a shot or scene. A prop coming in or out. An actress letting her hair down. Picking up a paper with their left hand. Note that you may have a set of circle takes but then the actor makes a choice you like, tipping their collar up because they love the ’80’s. Mark that down so you remember it later. You now have circle takes with a major difference in them which gives you options and potential problems with continuity. 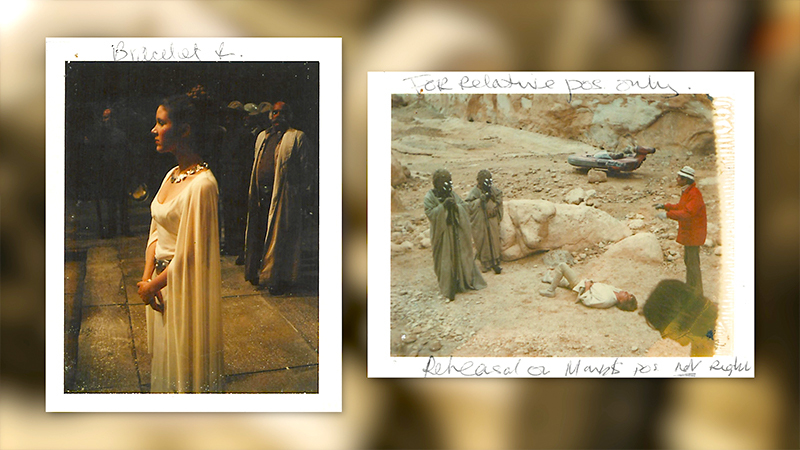 Polaroids were used "back in the day" as visual notes for costumes, hair/makeup, props, relative positions and more. Today, we're all digital. Back in the day, Polaroids were king. Script supervisors, makeup&hair, props, they all had them and took a lot of polaroids as a visual record. But this is the digital age. Your shots are also a record you can easily access. But it’s also good to have separate easier to reference stills. Take your own “polaroids" with whatever camera you want to use as long as you have a means to add notes to them like the scene number, character name etc. For the camera, we want to record the common lens and exposure info: lens focal length, f-stop, ISO, fps. Also what filters you used if any. On small productions, I record this info on the script supervisor sheet. There’s one additional number to record that I bet you didn’t think of. And that’s the height of the camera. Different camera heights equals shift in parallax between subject and background. A real pain when attempting to recreate a shot. If you’ve ever tried to recreate a shot based on a screen grab, it’s a pain. The parallax is always off. Knowing the height of the camera makes it a cinch. Where to measure it? To the center of the lens, not the bottom of the camera or the top of the tripod. Measure from the ground to the center of the lens to record camera lens height. This way, even if a different camera or tripod was used, you can recreate the same lens height. With lighting notes, we’re more concerned with setups. A setup is a lighting setup that could have multiple shots, generally looking in roughly the same direction: A medium shot, punching in for a close-up. You may tweak the lights a little bit for each shot but the main lighting setup is the same. Gaffers vary on the notes they take: pictures or lighting diagrams of a setup. But the one most important number that will help them recreate a setup, besides knowing the overall exposure light reading, is knowing what the contrast ratio was for the characters in a shot. Comparing a light meter reading between the key and the fill side of talent gives you your contrast ratio. The contrast ratio is between Key and fill. We go over that in detail in our video Lighting Daylight Interiors but basically, using a light meter you block the fill to get a reading for the key, and then cover the key to get a reading for the fill. This gives you this very important contrast ratio. Is the key twice as bright as the fill? That’s a 2:1 contrast ratio. On small productions, I keep all this info in the script supervisor notes. What is the best way to record all this info? It completely depends on what works for you. Quick and easy recording of notes on set saves important time. And you also need to easily access these notes and/or send them in a usable form to your editor. As I’ve shown, on short projects I keep it all in one place, on the script supervisor notes. I like paper. I can write whatever ever the hell I want on it, no batteries. But it does means I have to write them up afterward to send to my editor. Traditional clapper slate with shot and camera notes, done Pull My Focus style. Some of you may be shouting, what about the slate? Sure, it can record some camera info right with the actual shot and if it’s digital vs a physical slate, it might be able to output logs of all that data at the end of the day. 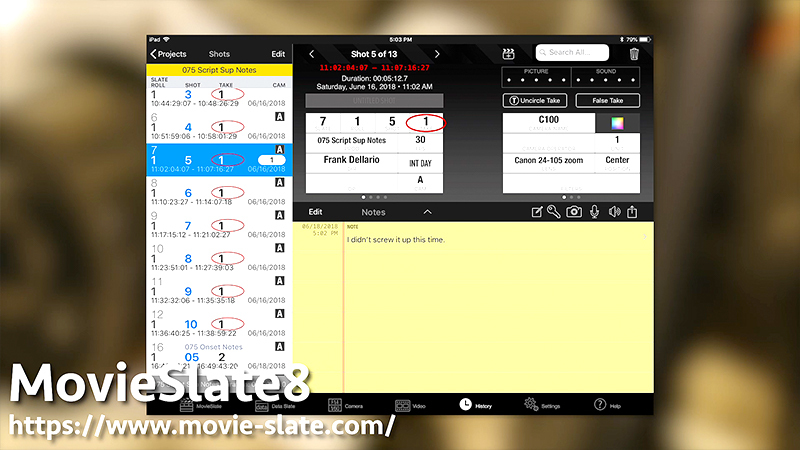 There’s Movie Slate 8 which does that, and lets you record circle takes and notes. It also flashes a quick burst of secondary screens with a lot more data you input. Movie Slate 8 continuity log screen. Allows you to mark circle takes and other shot notes, and send the log out to yourself or your post team. Though I prefer paper as things get crazy on set so one less digital item to deal with makes me happy. But some of these apps look great and can save time writing up that info later. We’ll test some of them out for a future video. I want to see how customizable they are as I’m particular about what info I want to record. Where do we get our forms? We just make our own in google docs and spreadsheets. So much easier. I’ve put some links in to examples below.